This issue concentrates on the new Local Development Plans, as a considerable number throughout Scotland are at the “Proposed Plan” or “Examination” stages: crucial for those involved in promoting or safeguarding the development potential of land. 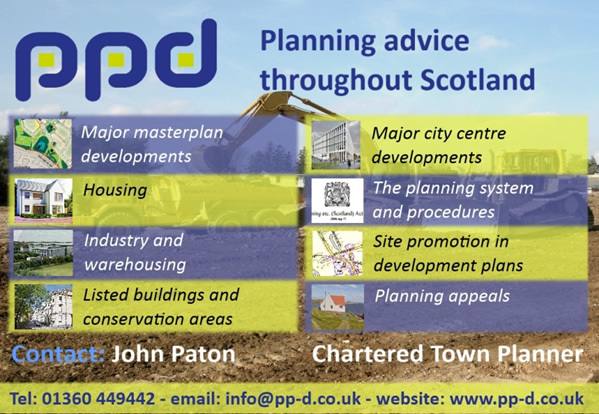 The planning system in Scotland is now firmly rooted in the Development Plan. There is now little chance of obtaining planning permission for the development of land unless it is covered by a relevant development policy in the Local Development Plan. Even minor developments such as house extensions are likely to be tested against an array of policies and guidance. The planning officer’s report on a recent planning application in Glasgow cited twenty-six relevant policies. Topics covered below are the Local development Plan process, click HERE; Housing Land Supply, click HERE; What is in the Plan? Click HERE, Glasgow proposed Local Development Plan, click HERE; Local Development Plan progress at a glance, click HERE; and can I speak at the examination?, click HERE. When the new Scottish Planning system was introduced after 2006, all planning authorities had to start the process of preparing new-style local development plans. While some were in the late stages of the old-style process and completed these plans, the vast majority started the process afresh, with the result that there are many plans which are roughly at the same stage in the process. The statutory stages of preparing a development plan are : preparation, publication and consultation on a “Main Issues” Report, preparation, publication of a “Proposed Plan” followed by a consultation process, examination of the plan by a Reporter appointed by the Scottish Government, then adoption of the plan by the planning authority. For good reasons, some councils have added extra stages : an initial “call for sites” to developers and land owners, and a process for modifying the Proposed Plan to take account of consultation comments before it goes to examination. All planning authorities are required to produce a “Development Plan Scheme” at least every year, which should include a Participation Statement stating when, how and with whom consultation on the plan will take place. We remain disappointed by the slow progress in preparing local development plans. Speeding up the process was one of the Government’s key objectives in reforming the planning system. Several councils have used the need to await an approved Strategic Development Plan as an excuse, but other planning authorities have been equally slow in areas where there is no SPD. Housing land supply is one of the contentious issues in most plans. The Housing Needs and Demands Assessment (HNDA) is the starting point, providing the evidence base for assessing the need for housing land. Councils seem to have learned lessons from the past where poorly-researched and structured HNDAs received stiff criticism from Reporters. Where planning authorities can prove that their HNDA is consistent with the methodology recommended in “Scottish Planning Policy”, and where the Scottish Government’s Centre for Housing Market Analysis has confirmed that the process and methodology used in the HNDA were considered to be robust and credible, Reporters are unlikely to question any finding of an HNDA and will countenance no further debate. However, the output of the HNDA represents only the first step in the process. The HNDA provides the evidential basis on which the subsequent stages, involving the preparation of a Local Housing Strategy (LHS) and the Local Development Plan, are grounded. The LHS is a statutory document which contains the Council’s strategy for meeting housing need and demand, investment in housing, and housing supply targets for all tenures. As with the HNDA, it is evident that Reporters are reluctant to question the philosophy and content of an LHS which accords with Government guidance on the subject. Translation of the HNDA and LHS findings into a generous “effective housing land supply”: i.e. that will provide and maintain “more than enough land” to deliver the required housing during the five-year plan period, is where the greatest conflict arises. Make over-ambitious assumptions on “windfall” sites or the ability of Councils to intervene, such as by bringing existing empty houses back into use or by existing large houses being sub divided. There have been suggestions that manipulation of figures takes place to artificially inflate the existing housing land supply, thereby reducing the amount of land that needs to be allocated. It has also been suggested that councils fail to demonstrate how the requirement in SPP to ensure that a minimum of five years effective land supply is maintained at all times will be assessed and any shortfalls resolved. We also note a failure by Reporters to challenge councils who narrow the definition of “affordable houses” only to social or public-rented stock, and not include a range of private-sector affordable housing initiatives. We also see the blanket application of affordable housing requirements even in settlements which already have a high proportion of social-rented stock, with the result that affordable housing contributions become a tax on those who buy a house, rather than a way of providing lower-cost housing where it is needed. We also see Reporters getting involved in site selection : being prepared to reject sites included in the Proposed Plan and choose others instead. The recent Stirling plan is an example. Those familiar with the old Local Plans will know how enormous and verbose some were, full of policies and guidance on the most trivial minor matters. The famous two-page “postman’s pouch” policy in Glasgow City Plan 1 was probably the most ridiculous example (the pouches are permitted development anyway!). The level of detailed micro-management in these plans had become completely disproportionate to the need for a policy context in decision-making. Most Local Development Plans are now much shorter and focus on key policy matters. If anything, the new Glasgow plan (see below) leaves too much out. The concern is that leaving the detailed policy and guidance to supplementary documents means that the detail is not subject to the rigor of independent examination. Our experience is that few councils are willing to make fundamental changes to their proposed planning guidance following consultation. The key seems to be getting a balance between policy (that is either accorded with or not) and the range of subjects that need it; and guidance (opinion and advice). A significant step forward has been achieved by Glasgow City Council in producing a Proposed Plan of only 70 pages and 12 policies! Previous Glasgow City Plans have been immense documents, and this volte-face to brevity is very welcome. The policies are of a general nature, and merely refer to forthcoming policy guidance for detailed application. This is reasonable in principle, but the guidance has not been prepared and is not therefore available for scrutiny and challenge. As can be said of Glasgow’s previous plans, “the devil is in the detail”. By not presenting the guidance at this stage prevents its proper examination and challenge. We are concerned that the same micro-detail found in the old plans will just be re-hashed in the form of guidance, free of effective challenge. Over-worded and confusing policies, such as Policy CDP 5 Resource Management which ranges over several subjects. This particular policy also crosses-over into matters that are the concern of Building Control legislation. Reliance on Community Growth Areas and brownfield land for new housebuilding : acknowledging that there will need to be focus on securing the necessary infrastructure to allow progress in these locations, but not elaborating. Our experience is that infrastructure costs can be ruinously expensive in developing CGAs. The immense detail of the “green network” : tiny sites are included, some in our experience may be as a means of frustrating development. It states that “The Open Space Map shows all open spaces within the City, including those protected, as open space, by planning policy”. It is hard to work out the difference between an open space and a green network site, and whether an open space is protected or not. We are in the process of analysing the plan’s detailed impacts on our clients’ interests, and welcome discussion on how the plan affects your development aspirations. 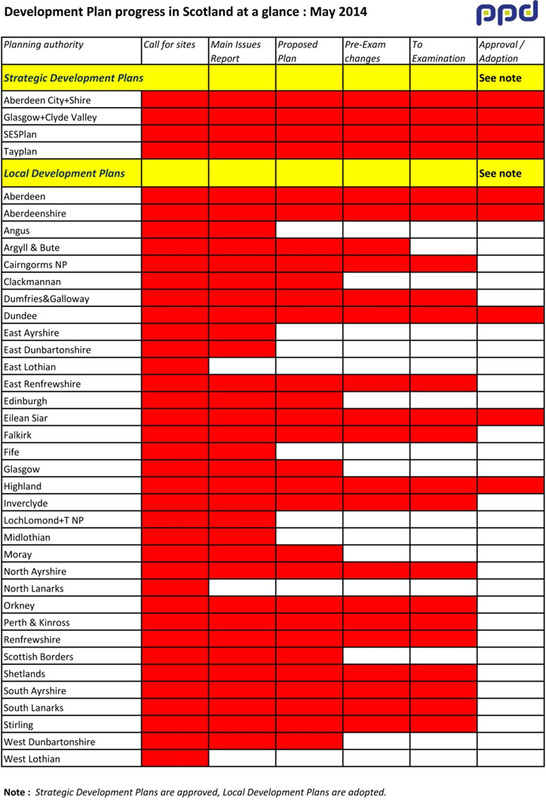 The following chart gives a shap-shot of development plan progress throughout Scotland. Some of the early Local Development Plans to be adopted were “hybrids” from the old system. As with the old local plans, West Lothian is among the last lot. North Lanarkshire were working on a local plan when the new system started, so continued that process to adoption in 2012. They therefore started work on the new plan later than others, and to be fair some other councils were still busy with nearly-complete old-style plans which they completed before starting new-style plans. Can I speak at the examination? Many people who have made representations on a proposed development plan would like the opportunity to address the Reporter directly. It used to be almost certain that such an opportunity would be granted by the Reporter, and an “inquiry” would be held at which most of the content of the Plan would be debated in detail, often with legal and counsel representation. These inquiries often lasted over a month and were seen as one of the reasons that the process took so long. The 2006 Planning Act and its associated legislation changed this by giving Reporters the sole right to decide what matters required verbal examination, and those that he / she could deal with using the written representations submitted on the Proposed Plan. The assumption is that the Reporter deals with most matters on the written submissions only, but can decide if specific contentious issues need to be addressed by informal hearing or full inquiry sessions. Our experience is that few topics are determined to need verbal examination, and those that do take the form of hearings. Nevertheless if you wish to address the Reporter in a verbal session, it is still worth making the request. Is your planning permission about to expire? Planning permissions granted before 3rd August 2009 where the development has not started remain valid for five years, until 2nd August this year. These permissions were granted with the standard five year time-limiting condition applied by the legislation in force at that time. It is therefore still possible to seek extension of these permissions by means of Section 42, provided that the application is registered by the planning authority before 3rd August. This applies to applications that are still valid at present : i.e. have not already expired. Extension cannot be sought retrospectively. If the development has started or will start before 2nd August – proven by submission to the planning authority of an “Initiation of Development Notice” – the continuing validity of the permission is secured.